Looking out to a dark ink ocean, we are far from dawn. Mosquitoes buzz around my body causing concern, if I get a bad bite I’m in trouble, because today we are selling skin. So no bruises, no bites, no tattoos, no unsightly pimples and no hair in unwanted places. 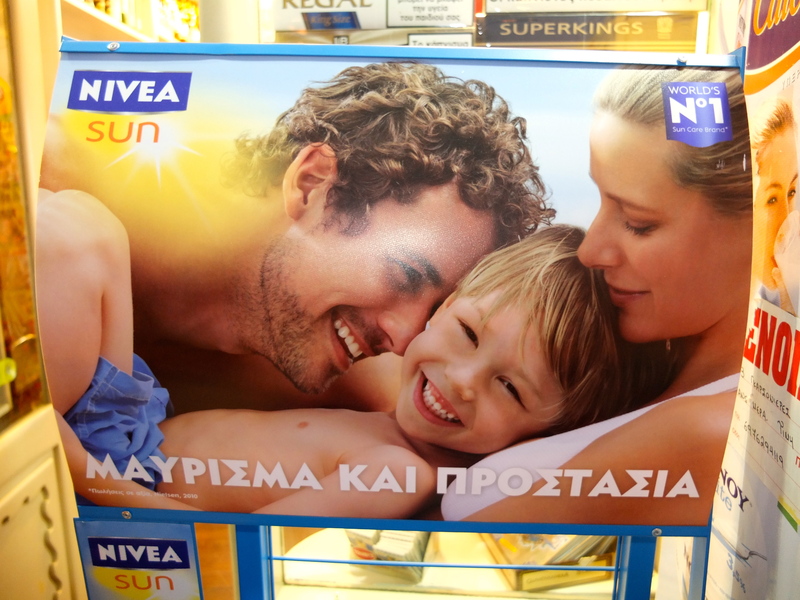 We are shooting Nivea Sun. The crew has travelled from all parts of the globe to a beach just outside Barcelona. We have built a tropical oasis set with shipped in palm trees. We have one week, to hunt down those perfect photos that will entice a customer to make that split second decision at the till to buy Nivea. At 4:30am my makeup van is open and we are ready for the business of preening. Full guns blazing, we are doing hair, nails, top to toe body makeup and sunscreen. The race to finish before sunrise to be on set when the sun is perfect LOOKING PERFECT is on. Sounds easy but when you’re struggling around in the dark, in a strange environment at 4am, after a long haul flight, trust me-you don’t even want to look in the mirror. The male model is Jeremy Veasey, from South Africa, and my ‘on camera’ partner. We have to act like a genuine couple holding hands, and rubbing lotion onto each other for the next week, so it’s a good thing that we get on. Then comes baby, we have a selection of child models on set for our family scene so I better get to know everyone. The talented Cleo Sullivan (photographer) has just arrived from NYC full of energy and we are ready to go, after the clients and advertising agency people from Draft FCB give us the all clear with the hair, wardrobe and makeup. Now we wait for the sun to be in the perfect place, with no clouds, make sure the wind isn’t blowing the hair in all directions, that the skin looks clean and fresh. Everyone is happy and energized; basically this is when all the magic happens. We wait for those special moments. If the trees cast a shadow in the wrong place, we get a bulldozer to move them. If the sun disappears behind a cloud, we have artificial lights to replace it. If it rains, we can’t shoot, but we have built tents close to the set, not only to keep out of the sun so we don’t burn, but also to keep us dry if it rains. This is a well-oiled machine, and the crew is prepared for anything. Even if the children get tired of performing in front of the camera, we have a little bed where they can have a nap, and then we start shooting another child. It’s all working perfectly, everyone is happy and getting on, and with about fifty people on set everyday, that’s an achievement. The week runs without many dramas, the weather was kind, the sun came out and lingered on the horizon glowing golden just for us. The children smiled and played happily. We always finished in time to enjoy group dinners, and a few cheeky glasses of wine. As an Aussie girl, I love being in the sun, but I can’t stress enough the importance of sun protection. You should definitely use Nivea.. 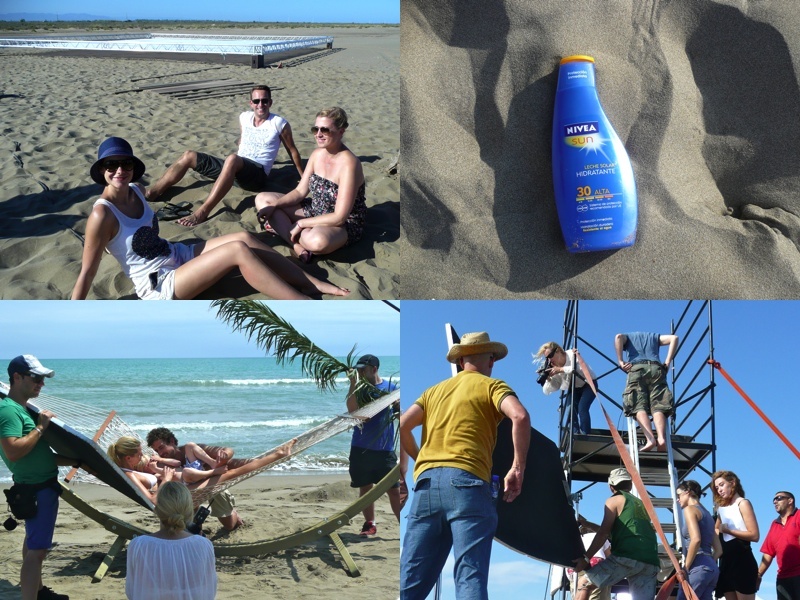 It is the world’s number 1 sun care brand after all.